• Marks on wet and oily surfaces. • Durable metal barrel and tip stand up to heavy use. • Excellent for marking corrugate, wood, metal, foil, stone, plastic, leather or more. • Quick-drying, fade and water resistant ink. • Writes 20% more than the leading permanent marker competitor. 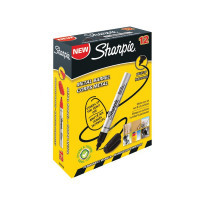 These durable Sharpie Pro Permanent Markers have a robust metal barrel and blocked tip designed for heavy duty use. The ink is fade resistant for long lasting clarity on a variety of surfaces. The bullet tip will produce a 1.0mm line width for bold writing and marking. This pack contains 12 black markers.